As the debate on conversions and Gharwapsi continue, it would be good to recall that this issue is not new. Intellectuals and national leaders from the early 18th century have been drawing our attention to the menace of conversions in India. Pragnya Bharat had conducted a public discussion on “The Ethics of Religious Conversion”. Speakers included eminent Indologist and Vedacharya Dr. David Frawley (Vamadeva Shastri) and Samineni Arulappa Archbishop of Hyderabad. Hinduism is based upon respecting reach individual and the swadharma of each individual. The highest goal of the Hindu religion is self-realization , not simply knowing God but understanding who we are and the Divine presence within us. It would be a tremendous loss if India gave up Hinduism and became another Christian and Islamic country. We have enough of them already. India has a wealth of spiritual tradition. Westerners come here for this wealth of spiritual knowledge. Infact, you should be exporting your religion. Today, throughout the world, and in the United States, with very little exception, there is no “Sarva Dharma Samabhava” taught in religion. It is something I never encountered in my Christian education in the West. Most of the We were taught that Hinduism was a religion of idolatry. ; it was religion of polytheism and superstition and there was no place for Hindus in heaven. The average Christian throughout the world has been taught to believe that only Christians gain salvation. To date, there is no major Christian leader or Moslem leader, in the world. Who is saying that Hinduism is as good as Christianity or Islam. Some people say all religions teach the same things and they differ in inessentials. Is the Law of Karma and the process of Rebirth something inessential ? Christian claim that their faith alone is enough to save you. This means that a person may be a mass murderer, but if on his death bed he converts to Christianity, he will go to heaven. Another person may live the life of a saint, but if he does not convert to Christianity, there will be no heaven for him. Recently in United State, a woman who had been convicted of murder was converted to Christianity on death-row and the Christian leaders- particular the fundamentalist Christians -asked for the death sentence to be removed because that woman had converted to Christianity and therefore the sin no longer counted. Why is this conversion business so big in India? Because India is the largest country and largest non-Christian country, in the world, where missionaries have the freedom to act and to propagate. 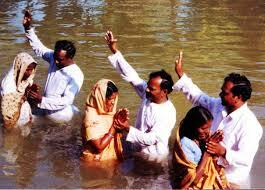 Islamic countries- Pakistan, Bangladesh- do not allow this missionaries activities to be conducted. In Saudi Arabia, you cannot even bring a Bible or a picture of Jesus into the country. China, also does not allow missionary conversion activities. Organized conversion activity is like a trained army invading a country from the outside. This missionary army often goes into communities where there is little organized resistance to it or which may not even be aware of its power or its motives. It will even take advantage of its communities that are tolerant and open minded about the religion and use that to promote a missionary agenda that destroys this tolerance. Evangelization sounds nicer and more ennobling than conversion. Such evangelical movements have world conversion strategies and programs to target India and Hindu state by state, tribe by tribe , even village by village. They keep track of the numbers o converts and mark them in the win column as gain for Christ. Missionary activity is like an ideological war. It is quite systematic, motivated and directed. It can even resemble a blitzkrieg using media, money, people and public shows to appeal to the masses in an emotional way. In fact colonialism has not truly ended but has recently taken a more economic rather than military form, along with the Westernization along economic lines. As Christianity is the dominant Western religion it continues to use the current economic expansion of Western culture to promote its conversion agendas. Even when it is a question of a Christian minority in a land dominated by a non-Christian religion, the non-Christians are often at a disadvantage in terms of money and media through the Western support that the Christian community has, particularly in regards to its conversion activity. They are using financial and media advantages including mass marketing, to promote their agenda of conversion. Evangelical missionaries still identify Hinduism with devil worship. Today it is illegal in most countries to promote racial hatred, to call a person of any race inferior or the product of the devil (which white Christians used to call the blacks until recently). Most such Christians have never seriously or open-minded studied Hinduism. They know little of Yoga and Vedanta or the great traditions of Hindu and Buddhist spirituality. They prefer to highlight the Hindu worship of God even in animal images like Hanuman as a form of superstition or evil. The Catholic Church is bit more diplomatic thee days. It is now telling Hindus that their religion may have some values but Christianity is even better. This view is a bit more tolerant but cannot be called sincere either. If Catholic no longer believe that Hinduism is a religion of the Devil, as they were promoting until only recently, they ought to apologize to Hindus for their mistaken notion and the problems that these must have caused. In India Christians claim that by eradicating the caste system they are helping people and raising them up socially. They could do this easier by helping reform Hindu society rather than by trying to destroy or change the religion. Clearly they are using, if not promoting the caste differences as a conversion strategy. Christian cultures still have their class and other social inequalities, particularly in Central and South America but Christians do not see that the religion has to be changed in order to get rid of these. Changing a person’s religion may not help them in terms of health, education or economics. Social work born of love is hardly to be found in missionary Christianity, though it likes to pretend that this is the motivation. In the West there is a cry against cults, which any religious movement out of mainstream Christianity can be called. There is a tendency to regard Hindu based religious movements in the West as cults. Under the guise of being a cult a religious organization can be sued for millions of dollars if even one disgruntled or disappointed former disciple can be found who feels they have taken advantage of. Many Hindu- based and yoga movements in the West have been sued as cults. People in India may believe that , in America, all religions are treated equally. Certainly the law requires that but this is not the fact of life. For example, it is still very difficult for Hindus to build temples in the United States, particularly in areas in which fundamentalist Christians are strong. To put it in perspective, one would say that it is over 10 times harder in America to build a temple than it is to build a Church. In many areas, temples must not outwardly look like a temple, but should look like a school or church or the local governments would not approve of them. Most Americans believe that Hinduism is a religion of cults. Organized Christian cult busting legal groups, with dozens of lawyers and budgets in man millions go around systematically encouraging suits against Hindus for Indian religious groups such as ISKON , TM Anand (a Yogananda group), The Himalayan Institute, Rajneesh and Sikhs under Yogi Bhajan to mention a few. Any Hindu-based teacher in America, particularly pone wo is working with general American public or bringing people rom Christianity to Hindu-based teachings, remain under a severe legal threat. The legal secularism of the West still hides much religious prejudice. We also note that the West politically will defend Christian interest overseas and criticize alleged discrimination against Christians. Recently the Russians criticized the Mormons, an evangelical American Christian group, as a cult. The American government lodged a protest to protect the Mormons and their missionary activity in Russia. No Indian Government so far has made any such protest to protect Hindu groups in the West. Source: “The Ethics of Religious conversion” book., written based on a public discussion conducted on the above topic . 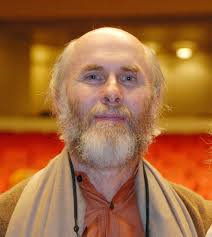 The speaker is an eminent Indologist Dr. David Frawley. This entry was posted in Exclusivist religions, Hindu Dharma, Social Issues, Threats and tagged Christianity, Church, Conversion, Cult, Hinduism, Missionaries in India, Missionary on February 25, 2015 by navayugbharati.